OKLAHOMA CITY (AP) — The Thunder scored the first nine points Saturday night against Dallas Mavericks. It was Oklahoma City’s largest victory margin in a playoff game since moving from Seattle before the 2008-09 season, and the lowest point total the franchise has allowed in a postseason game, in Seattle or Oklahoma City. Frustration mounted for the Mavericks, and Nowitzki was called for a technical foul late in the second quarter. Durant made the free throw, then made a 3-pointer on the next possession to push Oklahoma City’s lead to 52-23. The Thunder have been in enough playoff games over the years to understand that they need to refocus for Monday’s game. 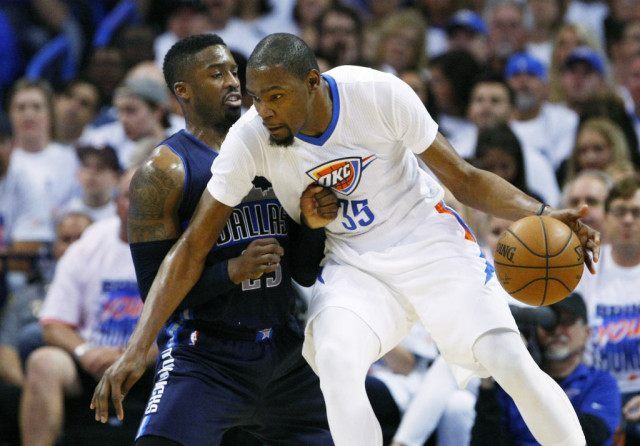 “Each game is different, and we’ve got to be ready for a different team,” Durant said. Dallas coach Rick Carlisle said he’s unsure of Barea’s availability going forward. Mavericks: F David Lee missed this game, and might miss Game 2 with a plantar fascia injury. … Salah Mejri started at center. The rookie started just six games in the regular season. He finished with one point and four rebounds. … Missed their first 10 3-pointers. … Carlisle was called for a technical foul with 4:43 left in the third quarter. Thunder: G Cameron Payne was inactive with hip soreness. Thunder coach Billy Donovan said it wasn’t too severe. … Improved to 5-0 against Dallas this season. … Outrebounded the Mavericks 56-33.